Ethel and Ernie were just a few months away from getting married. The anticipation and excitement was in the air, the dress, the church, the dream of a life beginning. This was certainly a consuming vision in any bride’s dreams. Ernie would have to take time away from his job for the wedding, as he worked a bit far from their soon to be home in the Soo. They were to be married in St. Luke’s Cathedral in Sault, Ontario on July 6, 1912. As the couple both worked through the months to the wedding, they woke to news one morning that would rattle the nerves of many, and send them to despair and grief. The world was small, and this was the kind of news that would reach around it quickly and hard. The biggest ship ever built, with a reputation as the ‘Unsinkable’ dove to an icy grave at the bottom of the Atlantic Ocean, on its virgin voyage. Just a few days after it set sail from Southampton, England, the Titanic did the unthinkable. It sank on April 15, 1912 and took over 1500 of its passengers with it, only some 700 managed to survive the horror. We can only imagine the terror that went through the minds of those fated people that night. The frightening knowledge of fate of those left on the ship. The grief and pity of those who had to leave their loved ones behind as the lifeboats floated them away in the frigid night air. What was the sentiment of the people around the world? Outrage, most definitively, the builders of the ship never had enough life boats to accommodate all of its passengers. The wealthy lives were regarded higher than any other passengers. People beginning new lives had them preempted by way of arrogance. What was the sentiment of my grandparents, I wondered. Ethel, was a feisty outspoken young suffragist about to marry…. a steamship captain of the Great Lakes. Ernie, who had been sailing on the Great Lakes since 1905 as a first mate took his first command in that ill-fated year of 1912. 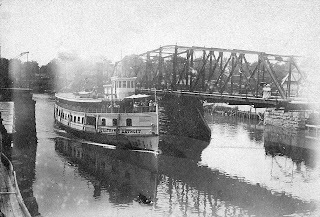 Captain Ernest Raeburn took the helm of the City of Chatham, a passenger ship that sailed between Sault Saint Marie and the Blind River. He went on to sail the Great Lakes from The Superior through to the St Lawrence Seaway to Montreal for 46 years. The Great Lakes may not have been the treacherous Atlantic Ocean, but the lakes could take the lives of those who rode the waves just as cruelly. Did Ethel wish Ernie had picked a different profession? Did the fate of the Titanic spark conversations of prudence, safety and….arrogance of man? Would they weather this life with strength and courage? Absolutely! Did I say Ethel was feisty? Outspoken? A strong woman that was able to keep up with this salty ol’ character….who would have never given up this love of the water, it flowed through his veins. Observances were made and lessons were learned and taught. She kept any fears in check. She lived their married life on land and raised a family, and when the ice froze the path he came home to her, every winter. And they never sank. I really like the way you wove the Titanic tragedy and family history together.You resemble your grandmother, and I bet you get your feistiness from her! I love how you related the story of the Titanic to the lives of your grandparents. It must have been very difficult for Ethel when Ernie was sailing. Stories of sinkings must have increased the anxiety of the possibility of a ship going down even on the Great Lakes. Thanks Ladies! I rather miss this blogging! Dawn- could be true could be true, would love to think so [feistiness]. A few of the men in our family followed in Ernies footsteps. Maybe not captains but shipmates for awhile, including my Dad during WWII, Merchant Marines. So Grandma had at least two of her men out there at the same time on the water, one on the GL and one on the Atlantic. [I am told]Grandpa had some stories of the storms on the GL.